Your fuel system is perhaps the most important system on any performance vehicle. If you do not have the fuel system to support the power of the engine, then your cars performance will suffer or even worse take detrimental hit. For these reasons, we offers our Adjustable Fuel Pressure Regulator. 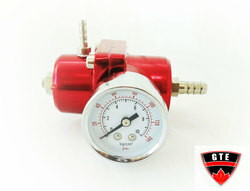 Made of polished aluminum, this lightweight regulator is universal and offers a 0-140 PSI adjustable range to tailor to all your vehicles fuel system requirements.